The Tempest has an ergonomic seat pad for added comfort and a "single locking strap"
The Prophecy has extra high end features like a "dual density" ergonomic seat pad and and a "double lock strap"
Ultra seat pad for added comfort and a single locking strap. The handle-hook allows the first time rider to get up easy and quickly and then automatically retracts flush with the deck when not in use. Strong 3" neoprene padded webbing "single locking strap"
The wide based tip design of the Tempest combined with its molded-in fins help make the Tempest a fun, stable, and comfortable board for all users. 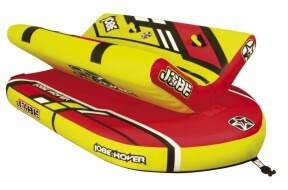 The molded-in fins provide added stability yet still allow for a steady rail-like edge. Kneeboarders of all levels will appreciate the stability, while advanced riders will like the extra width under the knees which helps soften landings and promote spins. The Tempest comes standard with our Ultra seat pad for added comfort and a single locking strap. The Tempest combined wider based tip design and in-molded fins help make it a fun, stable, and comfortable board for all users. 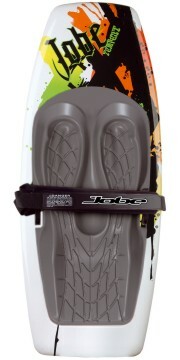 These molded-in fins provide added stability yet still allow for a steady rail-like edge. Kneeboarders of all levels will appreciate the stability, while advanced riders will like the extra width under the knees which helps soften landings and promote spins. The Tempest comes standard with our Ultra seat pad for added comfort and a single locking strap. 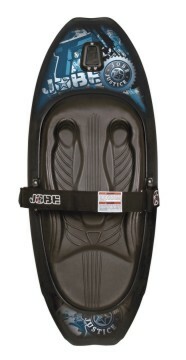 The parabolic twin tip kneeboard gives the rider a unique experience. Deep knee wells and a 3" padded strap keeps the rider in control and ready for even the biggest maneuvers. The Hydrohook allows the first time rider to get up easy and quickly and then automatically retracts flush with the deck when not in use.